16 When the sabbath was over, Mary Magdalene, and Mary the mother of James, and Salome bought spices, so that they might go and anoint him. 2 And very early on the first day of the week, when the sun had risen, they went to the tomb. 3 They had been saying to one another, “Who will roll away the stone for us from the entrance to the tomb?”4 When they looked up, they saw that the stone, which was very large, had already been rolled back. 5 As they entered the tomb, they saw a young man, dressed in a white robe, sitting on the right side; and they were alarmed. 6 But he said to them, “Do not be alarmed; you are looking for Jesus of Nazareth, who was crucified. He has been raised; he is not here. Look, there is the place they laid him. 7 But go, tell his disciples and Peter that he is going ahead of you to Galilee; there you will see him, just as he told you.” 8 So they went out and fled from the tomb, for terror and amazement had seized them; and they said nothing to anyone, for they were afraid. Note: This is a repost of lectionary reflection from March 31, 2015. Had you been there that first Easter morning, how would you have reacted? Before we get to that question, maybe we should stop and ask if we would have been there at all. In each of the Resurrection accounts, only a few people actually go to the Tomb, and it is always one or more women who make the trek to the tomb. It’s not Peter or James or John or Thomas or any of the other male disciples. It is the first day of the week (Sunday). Jesus’ body had been laid in the tomb following his horrific death on the cross a few days earlier. According to Mark, it was Joseph of Arimathea, a member of the Council, who had gone to Pilate and asked for the body. It was Joseph who wrapped the body of Jesus in a linen cloth and laid him in a tomb and rolled the stone into place. Joseph wanted to do the right thing. He didn’t want the body of one he had come to love be left to the elements. We’re told by Mark that two women, Mary Magdalene and Mary the mother of Joses (and James), watched the process from a bit of a distance (Mark 15:42-47). Everyone else had fled in terror. Now, on Sunday morning these two women, along with Salome, go to the tomb carrying spices so that they could finish the job of preparing his body for burial. This is clearly an act of love for one whom these women and others had pinned their hopes of a new era. They must be experiencing deep and abiding grief. What they’re not prepared for is the empty tomb and the announcement that Jesus had been raised from the dead. A young man (an angel) dressed in a white robe, told the “alarmed” women that the man they were looking for—“Jesus of Nazareth, who was crucified”—wasn’t there. The tomb is empty. He has been resurrected. Go and tell the disciples to meet the risen Jesus in Galilee. It is a lot to take in—at least if you had been there that first Easter morning. We already know the story. We’ve got the songs down: “Christ the Lord is risen today, alleluia!” and “Crown Him with many Crowns!” All that’s left after that is to go out for Easter Brunch! When it comes to preaching Easter Sunday, there are “better” texts to choose from than Mark 16. The lectionary offers us John’s version. I’ve preached it a few times. In John Mary Magdalene comes alone to the tomb. At first she finds it empty and tells Peter and John who check it out. Still no one runs into Jesus. 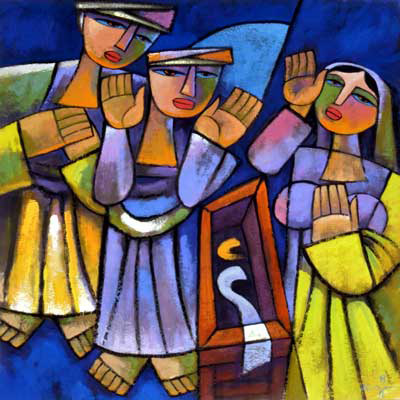 It’s only a bit later in the morning, as Mary contemplates the empty tomb and absent body that she meets the risen Jesus, whom she at first mistakes for the gardener. Where did they take him? She asks. Jesus reveals himself to her and ordains her to tell the other disciples the good news. Later that day Jesus will appear to the rest of the disciples—minus Thomas (John 20:1-23). It’s a very preachable text, while Mark’s version is briefer and seemingly incomplete. John’s version is what we expect to hear on Easter morning. Most of us are a bit uncomfortable with the brevity and seemingly incompleteness of Mark’s version. Something seems to be missing, which is likely why other endings were created to fill in the gap, to complete the story. For you Tolkien fans, think of the published version of the Silmarillion. I must admit that I’ve not read any of Tolkien’s works, but I know the story of the posthumous publication of Tolkien’s unfinished manuscript, which his son “finished” up so it was publishable. Whether he succeeded or not we’ll leave to the Tolkien lovers in our midst. But as with Tolkien’s son, it appears that some early Christians were clearly uncomfortable with the way Mark ends. After all, how can you end a story with the words: “the said nothing to anyone, for they were afraid” (Mark 16:8). Most preachers, at least those who share my embrace of the findings of the historical-critical method, will choose to ignore the longer ending of Mark (Mark 16:9-20), though I did preach it last year. It was quite an experience, since the longer ending not only fills in the gaps it talks about handling snakes, drinking poison, and speaking in tongues. That’s not in the wheelhouse of most of our congregants, so it’s best to leave it be. But, even though most modern translations will place it in brackets, it’s still there. [Sermon is contained in From Words of Woe to Unbelievable News: Alternative Voices for the Lenten Journey] . If we choose to take up this abbreviated ending of Mark, with questions left unanswered, what do we make of it? We would be wise to acknowledge that this is the earliest gospel account of the resurrection. William Placher reminds us that the earlier discussion of the resurrection – that found in Paul’s letters – had appearances, but no empty tomb. It is Mark that introduces the empty tomb, but there are no appearances. The later gospels will include both an empty tomb and appearances, but Mark like Paul only emphasizes one. Of course the tomb’s emptiness is not in and of itself proof of anything—plenty of explanations have appeared (the body was stolen, etc.). The Empty Tomb does signal, for Mark at least, that Jesus has been resurrected. It’s all he needs (other than the angelic interpreter). What this version of the story does provide us is insight into the nature of this encounter. The empty tomb, no matter what Jesus may have said prior to his death, was not expected (or at least not understood). We have a tendency of ignoring messages that don’t fit into our previously accepted categories. Jesus was dead. He was put in a tomb. He was expected to be there when they returned to finish the job of preparing his body. At the same time, the words that stand out in this passage are words like “alarmed,” “terror,” “amazement,” and “afraid.” These aren’t the words most of us would use to describe Easter Sunday. We want to grab hold of the joy not the fear. Fear is a central theme in this passage. The women are alarmed at finding the tomb empty and the angel sitting there all dressed in white. This isn’t unusual. Angels usually cause a bit of fright in the recipients of their visits. “Do not be afraid” is a frequent refrain. You would be a bit alarmed too. Of course we moderns can chalk all of this up to metaphor. Angels don’t fit into our world view, but then neither does resurrection! What happens next might be expected as well. The women flee. They experience “terror and amazement.” The first is fright and the second is awe. Something like that is always present in divine encounters, or at least it should. The experience of the women at the tomb raises another issue and that is the contrast between faithfulness and faithlessness. All through Mark, women have been faithful when men failed to be, and these women have come to the tomb to minister to Jesus’ body when the male disciples are long gone, but in the end no human beings are completely faithful. Fear captures us all. [Mark (Belief: A Theological Commentary on the Bible), p. 247]. Only God’s faithfulness will complete this story, and the God who has split open the heavens at Jesus’ baptism (1:10) and torn the curtain of the Temple at Jesus’ death (15:38) ‘will be put off neither by our failures, nor infidelity, nor by our most sophisticated schemes.’” [Feasting on the Word: Preaching the Revised Common Lectionary, Year B, Vol. 2, p. 354]. The story remains unfinished. The women run off in fright. They don’t tell anyone about their experience at the tomb. But, the story does get told. We’re here. We’re celebrating Easter. Somehow the women moved beyond their fears, though more likely it was Jesus who met them and the other disciples and embraced them with the faithfulness that is God. So yes, Easter is here. Good Friday did not have the final voice. Life wins. Death loses its sting, and with it our fears. Therefore, as Placher puts it: since we’ve heard the story “it is up to us, in our lives and our testimony, to tell it and keep it alive.” [p. 248]. Picture attribution: He, Qi. Empty Tomb, from Art in the Christian Tradition, a project of the Vanderbilt Divinity Library, Nashville, TN. http://diglib.library.vanderbilt.edu/act-imagelink.pl?RC=46107 [retrieved March 27, 2018]. Original source: heqigallery.com.